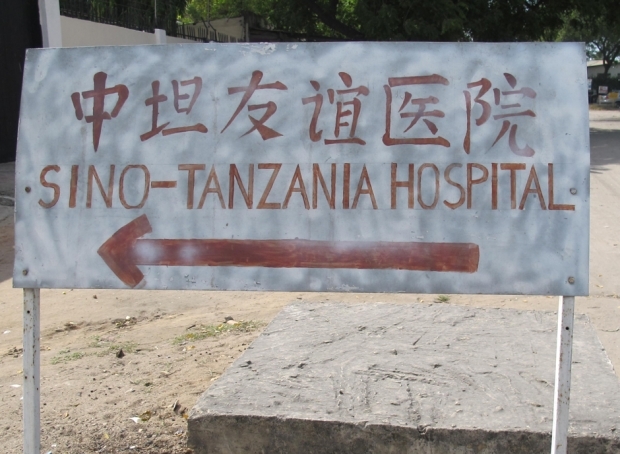 A sign along the road directs travelers to a Chinese-Tanzanian joint health aid project in Dar es Salaam, Tanzania. The reporting in Africa for this story was funded by the Pulitzer Center on Crisis Reporting. To see more stories in this series, click here. In 1967, as the United States sank into war in the jungles of Vietnam and China descended into the cataclysm of the Cultural Revolution, Chinese soldiers secretly fighting alongside the North Vietnamese also battled swarms of malarial mosquitoes. Showing remarkable foresight, Chinese Communist Party Chairman Mao Zedong amassed a secret team of top scientists with one mission: find a cure for malaria. As China—then a poor country, barely recovered from a devastating famine—added insult to injury by dismantling its scientific, medical, and educational institutions under Mao’s misguided program of political cleansing, the scientists labored on with clear purpose. Within a decade, some 500 researchers, many of whom were persecuted politically along the way, developed an ingenious drug called artemisinin, pulling off a medical marvel against the odds. Coartem’s artemisinin-based combination therapy (ACT) is one of the many variants of malaria medication that have been copied and faked in Tanzania. The packaging is typically well-made, but there is no guarantee about the contents. This dose is for children with malaria. The scientists and researchers of the People’s Liberation Army’s Project 523, named for its May 23 creation date, made one of China’s greatest contributions to modern medicine at the same time as Mao was destroying the foundations of China’s scientific establishment. Mao’s great medical innovation was withheld from the world for four decades because of Chinese military secrecy and intense global pharmaceutical competition. Today, it is the key ingredient in the frontline treatment for malaria in Africa. Yet before artemisinin even has a chance to get a foothold in the battle against malaria, the drug is in danger of becoming a casualty of China’s own overzealous profiteering and global drug counterfeiting. In East Africa, artemisinin combination therapy, or ACT, became the preferred treatment for malaria a few years ago. Along with the massive influx of lifesaving drugs, first from European manufacturers and now from China, came a deluge of fakes. In Uganda and Tanzania, whose lands form most of the mosquito-infested Northern and Southern shores of giant Lake Victoria, the malaria death rates are among the highest in the world. Widespread regulatory failure and unscrupulous business practices have created a market flooded with bad drugs. Coupled with China’s already bad rap as a producer of inferior goods such as cheap shoes, knock-off phones, and faulty condoms, the reputation of China’s malaria cure is perched on a precipice. A small but growing body of evidence partly faults China for the massive upswing in counterfeit medications in Africa. There is proof of bad medicine originating in China, including the recent haul in France of 1.2 million doses of fake aspirin, some bound for Africa. Until now, the deadly risk of fake medications flooding Africa has been under-studied and under-reported. The Wellcome Trust and others estimate that one-third of malaria drugs in Uganda, including ACTs and all others, may be fake or substandard. From the streets of Kampala to Lake Victoria’s shores, fakes are abundant. Dispensary workers are cagey when asked about fake drugs, but admit they exist and they can do little to tell which are real and which won’t work. Thousands of private pharmacies have opened in recent years, offering quick remedies to maladies that have plagued the region for generations. The pharmacy boom has given counterfeit drug rings a major foothold. Locals routinely blame China for the bad medicine they peddle. There is little relief. Fakes come in expertly copied packaging, down to exactly replicated logos, country-of-origin labels, and crisp foil strips, capable of fooling even medical professionals. The best pills bear the same inscriptions as real drugs, but contain little or no real medication. Only lab tests can spot the bad drugs, and testing equipment is scarce and expensive. For those with no time to wait in line for a day to see a doctor, taking malaria pills is a game of chance. Even major Western aid agencies have been duped by fakes of drugs as critical as antiretrovirals for AIDS patients. As aid donations of free malaria drugs to clinics in sub-Saharan Africa rise, filling shelves with pharmaceuticals, the patient demand for pills has boomed: finally there are cures and everyone wants them. But the boom also has opened a new consumer market for bad drugs. Just how dire that picture might be for China’s homegrown malaria cures is becoming evident to the drug’s champions at home. Artemisinin’s inventors are concerned the damage will undercut the country’s great medical innovation. This explosion in fake medications in East Africa did not come without warning, nor has the growing suspicion of China in Tanzania and Uganda. As elsewhere across the African continent, China’s presence has mushroomed in Uganda in the past five years. Though there is intense debate over how to quantify China’s investment and aid to Africa, China now is among Uganda’s top trade partners and its health aid has grown from nearly nothing five years ago. A team of doctors from Yunnan, China perform acupuncture on patients in the $10 million Mulago Hospital in Kampala, Uganda. China moved into Africa in its own way, with the government, state-owned companies, and private businesses all doing deals on their own terms, avoiding involvement with international organizations that work on health, education, and poverty reduction. The strategy has been both vilified and lauded as an alternative to Western-style aid, which critics say comes with too many strings attached. There is evidence this also has led to cutting corners and backdoor deals that might not be in the best interests of the most vulnerable. China is sensitive to international criticism of its dealings overseas and has responded by developing its own health aid. Since it has all but eradicated malaria from within its own borders and created its own ingenious cure, what better place to focus than Africa? In recent years, Beijing has promoted plans to open at least thirty malaria treatment centers across Africa. Yet the malaria clinic in Dar es Salaam that was trumpeted by Chinese state media was closed when I visited last year, barely a year after it opened. Patients and staff said the facility was unused because doctors were not trained how to operate the equipment from China. There is no reliable source of information to determine the number of Chinese clinics opened or shut in Africa—none except perhaps those records kept by the global drug companies whose salesmen must fill new orders each month. A primary trouble with China’s medical aid on the continent is that it has not been subject to independent oversight. A lack of follow-through at many clinics has added to a growing negative perception of China in East Africa. Yet some Chinese medical aid is working, particularly when it involves manpower. For example, a team of doctors dispatched from China’s subtropical, and once malaria-infested, Yunnan province to Kampala to work in a newly-funded Chinese hospital has a long roster of patients eager for their expertise and treatments like acupuncture for pain. Uganda’s health-care system suffers a serious shortage of personnel, so the Chinese doctors are filling a gap. But even those doctors were running a private, for-profit backdoor pharmacy, undermining their purely humanitarian aid mission in Uganda. Finally, the Chinese doctors stopped selling malaria drugs when the pills became legal, according to the store manager. In other words, it was no longer a profitable sideline. The drugstore now mainly hawks libido-enhancing tea from China. Perhaps no one is more sensitive to the issue of counterfeit medicines than China’s government. After my articles on fake drugs in East Africa ran in The Guardian in December, China’s Foreign Ministry called their claims “groundless” and defended its pharmaceutical industry and its aid to Africa in reports and editorials in state-run media. Nearly two years after the delivery of Chinese drugs detailed in U.S. Ambassador Lanier’s cable, Uganda’s own Ministry of Health said the drugs were safe, although the WHO had not approved them. The deadliest problem remains counterfeiting and fakes, risking lives and threatening to kill China’s potential for real medical aid in Africa. The global drug counterfeiting trade, a $75 billion-a-year business, is hidden behind layers of organized crime and by foreign governments and the global pharmaceutical industry, wary of getting on China’s bad side. But as 80 percent of all active ingredients in pharmaceuticals made worldwide come from either China or India, those two countries are the prime suspects when it comes to bad drugs. Corruption and China’s damaged reputation are far from what the innovators of Project 523 imagined in their groundbreaking quest for a malaria cure. According to an unpublished history, New Drugs from Ancient Chinese Remedies: Unsung Heroes in Unusual Times, sent to me by the author, neuroscientist Yi Rao, and researchers at Peking University, the discovery of artemisinin by Chinese scientists in 1967 was nothing short of a wonder, given the chaos of the times. Chinese traditional healers had been using the leaves of the sweet wormwood plant, or qinghao, for two centuries to treat malaria and fevers when Project 523 began. Though villagers in Southern China knew of the plant’s curative properties, it took the better part of a decade for government and military researchers to isolate one particular chemical and the correct dosing that would cure malaria, not kill the patient. Tu got most credit for the discovery, despite its having been the result of the work of fifty institutions and more than 500 scientists. In 2011, she became the first Chinese scientist working in China to receive the $250,000 Lasker-DeBakey Clinical Medical Research Award, a prestigious U.S. foundation prize given for medical advances. Malaria-focused aid groups say artemisinin and resulting ACTs are revolutionary tools for Africa, yet the intriguing tale of the drug’s invention in China and its eventual emergence as a first-line treatment is getting lost in the deadly battle against fakes and counterfeits. Festus Ilako, Tanzania Country Director for the African Medical and Research Foundation, is confident ACTs have dramatically reduced malaria deaths and that the disease can be defeated with the drugs. Unfortunately, the prevalence of fake medicines in Tanzania, Uganda, and elsewhere across East Africa is worsening, according to medical professionals and academics. But when it’s fake, it cures nothing.